Where Do the American Crocodiles Used by PanAm Come From? The skins that PanAm Leathers processes come primarily from captive-bred crocodile farms in Colombia. Using farmed crocodile skins helps to ensure the highest possible quality of exotic leather, as there is less risk of the crocodiles getting into fights with wild animals and being hurt. Overall, American crocodiles are on the larger size for crocodilian leathers, but are not the largest. They are out-sized by both Nile and saltwater crocodiles. With no bone content, the American crocodile is softer and more pliable than some other crocodile leathers, making it ideal for clothing and garments. Some other key differences that reinforce the acutus’ usefulness for garments are that they are farmed to larger sizes than other species and the square belly scales are a larger percentage of the midsection versus the circular flank scales, relative to other crocodiles. 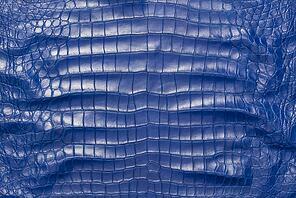 Large, clean skins and square scales are both very desirable qualities for crocodile skins being used for garments. Are There Restrictions On American Crocodile Leather? Yes. At this time, American crocodile leather is not approved for import into or trade within the USA. PanAm stocks these skins in our Paris showroom for purchase in person or through our European online shop. We can also ship from Paris or directly from our tannery in Bogota, Colombia to almost any other CITES-member country.